We’d love your help. 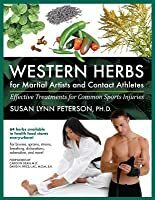 Let us know what’s wrong with this preview of Western Herbs for Martial Artists and Contact Athletes by Susan Lynn Peterson. 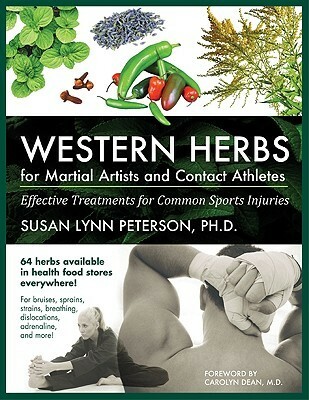 To ask other readers questions about Western Herbs for Martial Artists and Contact Athletes, please sign up. As a newcomer to herbal medicine (and someone with a science background) I really appreciated the philosophy behind this book. It was presented in layman's terms but the copious endnotes attest to the research that went into its production. Even more importantly to me, Peterson went out of her way to emphasize the risks alongside the benefits of using herbal medicine, and passionately exhorted her readers to take control of their own health by doing additional research (she provides some resourc As a newcomer to herbal medicine (and someone with a science background) I really appreciated the philosophy behind this book. It was presented in layman's terms but the copious endnotes attest to the research that went into its production. Even more importantly to me, Peterson went out of her way to emphasize the risks alongside the benefits of using herbal medicine, and passionately exhorted her readers to take control of their own health by doing additional research (she provides some resources in the back to aid in this process) and always obeying the adage of "buyer beware." This is a book that rewards significant study, a cover-to-cover reading rather than a cookbook-style pick and choose approach to particular herbs and/or injuries. However, Peterson has been careful to layer information so that even readers who try to use the book as a reference manual without reading all the introductory/explanatory sections will still receive the most vital information: the safest and most effective ways to use each herb and any medical contraindications for each herb. She also conveniently notes how much evidence of effectiveness (and she considers both rigorous scientific studies AND traditional practices as evidence, but is always careful to note which applies in each case) there is for each use of a particular herb. This is a great book for any one interested in herbs and not just for martial artists or contact Athletes (jogging, basketball, Pilates, etc). I was impressed with the easy to read layout, although the author put in hundreds of hours on research. It's an easy layout to follow with detailed information on the herb and answers questions "What is it good for?," "How do you use it?," "How much do you use?" "What should you be aware of before using it?" And the author also includes easy to follow reci This is a great book for any one interested in herbs and not just for martial artists or contact Athletes (jogging, basketball, Pilates, etc). I won this with the First Reads. It is really easy to understand and can be useful for lots of different people, not just martial artists or contact athletes. Well put together with pictures and descriptions as well as effectiveness. A very good book. I won this book free from First Reads. It has arrived and I am looking it over now. It contains a lot of information and I need time to digest it all. Thank you.